With so many ebooks in the marketplace, it’s important that your book cover makes a lasting first impression so that it captures a reader’s attention when it shows up in the search results. If your ebook doesn’t have a professional looking cover that aligns with its niche, there’s a good chance your reader will skip right over your book before they’ve even read your blurb or first paragraph. Just imagine – a sales opportunity lost within seconds because you didn’t invest the time, thought, or effort into your ebook cover. In today’s show you’ll find out more about the different elements you should consider in the design process and your role as an author. We also discuss how to find and work with a professional cover designer. Listen to our podcast, watch our broadcast, listen to the podcast, or read the transcript of the show below. Today’s show is going to be about cover design and we’re going to be looking at key cover design considerations. But then also, we’re going to be looking at what your role is, as an author. And then we’ll look at finding and working with a cover designer. We’ve got all sorts of tips, ideas and additional resources that will help you, as you are approaching your cover design process. Michael and I usually start off each show by talking about what we’re currently working on. So, Michael, if you want to kick us off? Michael: Yes. Actually I have something that I’ve finished that is really relevant to this month’s topic. And that is, my very first novel has received a cover makeover. 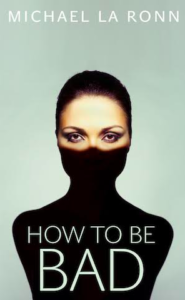 I got a new cover for my first book, which is How To Be Bad. I have re-branded it and I have also re-titled it. 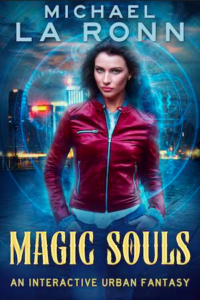 The new title is Magic Souls. When I first brought out the book, it was more of a pre-made and I didn’t really understand the concept of covers. I really didn’t realize that it was an urban fantasy. Now, I’ve got an urban fantasy cover that is more narrowly defined and it makes it very clear that it is an urban fantasy title. I look forward to talking about that little bit more. And other than that, I am working on book three in my up coming Lit RPG series. So, thick into the writing of that. Jay: Great. You’ve had a busy summer then, by the sounds of it? Michael: As always, I have to stay busy. If I’m not busy, I’m just sitting in a chair, just staring at the wall. I have to do something. Jay: I doubt that, I think you run around 900 miles an hour. You live like you write. Michael: Yeah, yeah, pretty much. I’ve also started law school, so, as we record, this has been the first week of that. So, that has been a little intense too. Jay: And it’s probably only going to get even more intense as the years go by. Michael: Yeah, yeah, but I can handle it. I wouldn’t have signed up for it if I couldn’t handle it, so, how about you? What are you up to? 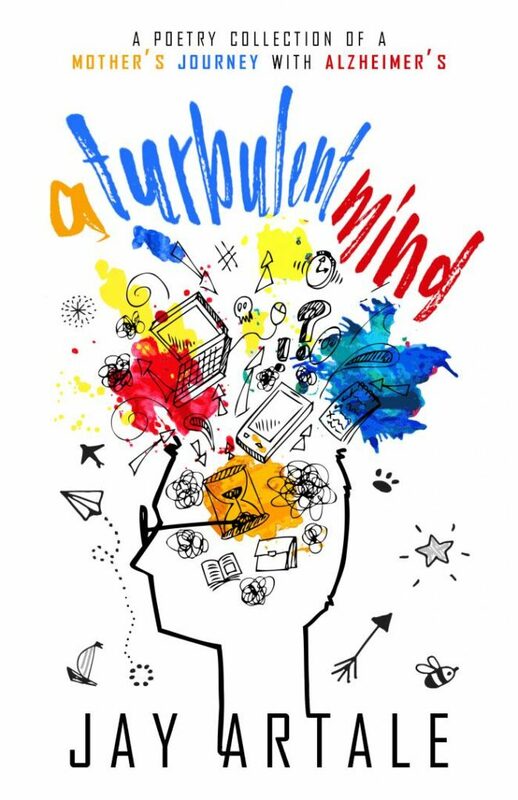 Jay: My poetry collection, A Turbulent Mind, is getting closer to the finish line, so I’ve been doing some research to get some ideas of what I want my cover to look like. This is the first time I’m using a bespoke cover designer, which is exciting. And it’s for my passion project. So, I’m trying to put everything into this one. Even if it doesn’t sell one copy, I just want it to look beautiful. Michael: Exactly and that’s great. Because poetry collections, the thing about them is you have a lot more latitude because there is no standard. You can’t look at a poetry cover and think, “oh, that’s a poetry cover”, right? So, you can create something beautiful. Yeah, that’s awesome, you’re getting real close! Jay: Right, let’s get started on our topic today which is ebook cover design. We’re going to start off with some ebook cover design basics. Now, obviously you have a cover design and you’ve got your aspect ratio for your ebooks, but you’ve really got to make sure that you don’t underestimate the importance of a thumbnail image. Michael: Yes, that is important. Thumbnail images are critical because when you think about it, and I love that you mention this first too, because it really does guide your thought process when we’re going forward with this. When readers first see your book on Amazon, it’s going to be a thumbnail, or on Kobo or on Apple. It’s really important that it looks clear and that readers can tell what’s going on. Jay: You’ve got to look at the whole gambit, once you’ve got your book out there and you’ve got your cover design, then you’re going to do promotion as well. Although you’re focused at this stage of looking at a cover design, looking at how you can take bits of it or use the whole thing and how it will look on a tweet or on a Facebook post or a Facebook ad or wherever your book is going to be featured. Michael: Another thing too is, thinking about the marketing. And what is marketing? Marketing is making sure that the cover appeals to the right people. Also helping them understand what genre it is, at first glance, within a split second. And then just making sure that it’s narrowly targeted towards those people. If you’re writing space opera, if you’re writing a poetry collection, if you’re writing a non-fiction self-help book on authors, you just want to make sure that it dials down into that audience. It’s so important but at the same time, there’s this balance that you have to make because you want the book to look amazing but you also want it to look like the other books that are in the genre. There is a balance between standing in and standing out, right? Jay: For the genre that you write in, what would you see as some of the key elements to have on the covers if you want to make sure that your books are associated with your genre? Michael: For my space opera series, all I knew is that I wanted it to have a space ship on the cover and I wanted to have things getting blown up. That, for a space opera, it’s really that simple. Space ships somewhere on the cover [laugh], you know? And it sometimes helps to keep it that high level. If you’re writing an urban fantasy with a heroine protagonist, you just want to have an assertive heroine on the front of the cover, right? She can be pretty, she can be attractive but she needs to be assertive and it needs to be clear that the book is about a heroine. I think it is easiest to keep it super simple when you’re thinking about your genre. If you’re writing a fantasy about dragons, have a dragon on the cover. If you’re writing an epic fantasy that’s like Game of Thrones, have swords or shields or things like that on the cover. I think that it’s pretty easy to just dial it down into one big thing that you can have on your cover. If you can find that, it will help you so much. Jay: There are so many elements, which is why working with a cover designer is the best option when you’re doing an ebook because they think about that. They think about the balance of the different typographies and different covers. When you’re trying to design your own cover, there are so many different elements that you’re trying to do. The best thing is doing research on Amazon. Finding your niche, like Michael says, and doing research and seeing what books stand out and which books appeal to you. When you see a cover that you like, what are those elements that stand out for you and really appeal to you? Create in a clip file or something like Evernote, just take those images to create a file of all the different design ideas that you like and whether you’re going to design your own covers or whether you’re going to get a designer to do it, at least have those ideas but then at some point, you need to stop looking and start focusing on your own cover, don’t you think? Michael: Absolutely, I use Pinterest to collect covers that I like. It helps a lot because you can send that board to your cover designer, you can send a link and say here are all the urban fantasy titles or here are all the romance titles I like, make something that looks like this. That’s been something that has worked really well for me. But what I would like to talk about is, the four core elements of any cover. I think any cover has just a couple of elements that you want to keep in mind and I’ll go over those real quick. There’s the foreground, the very front, the focus, the visual focus of the cover, the background which is the background [laugh] and then there’s the title and then there is the author name. When you think about that, you can look at a cover and you can isolate each of those different elements. If you’re looking at, like I was with my book, Magic Souls, urban fantasy. And I wanted something that fit in with the market place for urban fantasy, I would look at all the different covers out there and I would look at the different kinds of heroines they had in the foreground. I would look at what was going on in the background.Is there a city, is there an ocean, is there a forest, what is it that’s in the background? And then you had the title, and there’s typography and different fonts and things that you see more in certain genres than you do in others. There’s a resource that I’ll talk about a little bit later that will help you look at some of that stuff. Once you see that, it will open your mind. Then the author name, what does your author name look like? What font is it in? What color is it in? All those things are what give you the subtle clues as to what genre the book is in and what genre you want your cover designer to target. I just thought I’d throw that out there because if you think about those four elements, instead of just looking at a cover and thinking, “ ok, I like that”, and you don’t really know why you like it, you can start to break it down and isolate it and that helps you give better feedback to your designer. If your designer gets it wrong, or if they send something in and maybe it looks really good but maybe the title of the book isn’t quite there, it needs a different font, you can give them that specific feedback. Jay: Yes. Actually one of the most pinned images I have on Pinterest is a book cover design typography cheat sheet that shows complimentary typography that works together. Jay: Yes, we’ll have to include it in the show notes because it is really good. There are so many fonts out there and I think that’s part of the challenge when you’re designing a cover, there’s so much to do. That’s why breaking it down into that foreground, background, title and typography is so good, but within each of those four core elements, there are so many different directions that you can go. When you’re writing your first book, something that you’ve got to have in the back of your mind as well, is ok, if this is book one of the series of four or five, will this cover design lend itself to something that can be the first part of the series? Michael: That’s a great point because your designer really can’t do that. You have to give that instruction to your designer. Your designer doesn’t know, unless you tell them that it’s book one of a series, they’re only going to design what you’re telling them to design. That leads to another great point, authors play a very critical point in this, don’t they Jay? Jay: Yes, it is a key role. It’s one of the funniest parts, lots of people turn their nose up at internal formatting and distribution, and some people don’t even like doing the marketing promotion. But cover design seems to get everybody excited because it’s a really critical element and it’s a fun thing to do. Whether you’re doing it yourself or getting a designer to do it, being involved, it’s not an abdication of responsibility on the authors’ part. You really need to get stuck in there providing information. But also knowing what you want before you start. Whether you’re doing it yourself or whether you’re working with a cover designer. You’ve got to do some research. It doesn’t matter which route you’re going down. You have to go and see what’s in your niche. You have to know what niche you’re writing in. 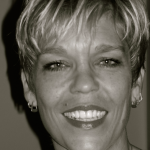 It can get a bit complex when your niche and your writing spans a couple of different niches. But there’s so much information out there on Amazon. Are there any other sites that you do research for cover design? Michael: If I’m looking at typographies and things, just looking to see what kinds of typographies are out there, dafont is a good one. Fontsquirrel is another place where you can go to look up fonts and find out what’s out there. Those are really the two primary tools that you can use. I think you have to be careful not to spend too much time and get stuck in an analysis paralysis. Jay: Definitely, so, anything else to do with author role? Michael: No, I just think it’s important, like you said, it’s important not to abdicate your responsibility. But at the same time, it’s important not to rule this with an iron fist. I see authors do one of two things and this is what can get them into trouble. Is, “oh, I’ll just leave it all to my cover designer, it’s all good”. And then they pick the wrong cover designer, and they get a cover that maybe they’re not happy with or maybe it just doesn’t quite dial into that sweet spot of the genre. The other side of that is trying to direct the designs too much. So, I want a king on the cover and I want him to have glasses and I want a space ship above and I want him to have a fur coat on. And then I want there to be a castle on the background.At that point, that’s just too much [laugh]. You can’t give your designer that much information, you’re going to end up with something that just looks like a mess. You’re going to confuse your designer. And it’s going to make even the best designer, probably unlikely to help you. You have to find that balance and we can talk a little bit more about that as we move forward. The authors’ role in this is to be more of a guide and a coach, rather than a ruler [laugh], or you know, we’ve got to control everything. Jay: Yeah, and I think one of the important things is that the cover is not set in stone. If you fall out of love with it then, you can get a new one and just switch it out and it’s really easy to do that. I see so many authors that rebrand themselves, they change the direction of where they’re going, it’s not something that you need to be scared to do. It’s really important not to hang back from releasing your book. Choose the best cover that you can, release it and then if you fall out of love with it, a year, two years from now, know that you can change it and revamp it and then there’s a good excuse to do some promotion and marketing around it, because you’ve got a new cover. Michael: Exactly. Speaking of getting new covers and changing your covers, why don’t we talk about how authors can find cover designers and how they can start the process. If you’re listening to this and you’ve never gone through the process before? Where would an author start? 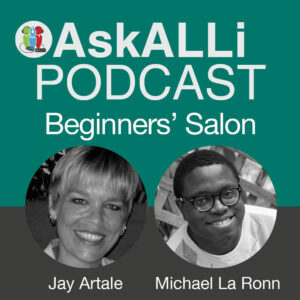 Jay: One of the best ways and how I got my cover designer is through referrals. I belong to the ALLi members’ forum and in there, there are people talking about different covers that they designed and we ran a book cover competition with our Book Expo, Indie Author Fringe, which happens usually around May/June. And seeing book covers there and finding out who has done those book covers. Referrals is a great way, when you see a book that really resonates with you and it’s in your niche, then knowing that that designer can design in that niche and can maybe imagine your aesthetic and put it on a book cover for you. 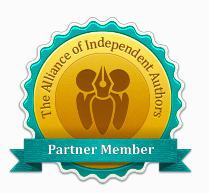 Also with ALLi, we have our partner members and we have lots of cover designers that are vetted services that have gone through a watchdog vetting process. We know that each of the cover designers that is an ALLi partner member, delivers up to a specific standard and they’ve got a code of ethics and they follow that code of ethics. There are lots of people out there that can design your cover for you, but you just have to make sure that you choose the right one. I think referrals would be my number one tip. Michael: I agree. If it’s possible and if you can find a designer within your budget that has experience in your genre, that’s always going to be the best, for example, there’s a space opera cover designer who everyone uses who is considered to be one of the best. You can use a cover from him and you can afford that, that’s fantastic. If you can’t, then, ask around and find the best designer that works within your budget. Jay: Have you found that when you look inside a book on Amazon, that it mentions cover designers in there? If we did research on Amazon and we found a book cover we liked, whether it would show up as cover designed by X person? I’m not sure. Michael: Generally no, every once in awhile you will see someone who will give attribution to their cover designer and I’m not really sure why that is. Maybe the cover designer asks for that or maybe they were being generous? But typically you can find it, it’s kind of best practice, most indie authors will list whoever their cover designer is, somewhere within the front matter of the book. If you go to the look inside sample, on the copyright page, usually you will see who edited the book and then who did the cover design. If you can’t find it there, then I would just reach out to the author and ask them. Most people are more than happy and receptive and love to share who their cover designer is. Jay: I know when you upload your book to KDP, there’s a section that allows you to add who your editor is, so you can give them credit but I don’t think they have that for cover design, which is a bit odd isn’t it? It’s such a key part to ebooks. Michael: Yeah, you can do it for illustrators I think. I’ve seen some book covers where an illustrator did the cover and they give credit to their illustrator because maybe there’s some contractual agreement to do it. But I don’t think there’s a section for cover design though, which there should be. Jay: There should be, yes, it’s such a critical part of the book, it’s the first thing, I know when I’m looking down, say, the top 20 books, I’ll click on the cover, before I read the text, I see an image and that’s what attracts me. Michael: Yeah, definitely. And another area that you can find designers on, because we’ve talked about referrals and I think that’s the method that you and I both would recommend first. But if you don’t have friends that can give you a referral, if you’re venturing into a new genre, you may not have anyone that you can lean on that has experience in that genre, and so, you can go to designer websites. I’ll list a couple of these, just know that these change regularly so, depending on when you’re listening to this, you may just have to do a Google search. There are a lot of freelancing websites out there that will allow you to look for designers specifically. So, 99designs is one, where it’s more crowd-sourced, where you can list the details of your project and then you have different designers bid on working with you and you can choose from a myriad of designs. Just a lot of different designs. That’s a great tool if you’re not quite sure what you’re looking for or if you want to have some different choices. Upwork is another choice that allows you to hire freelancers. I used Upwork quite a bit in the beginning of my career to find good, reputable editors. That’s a tool that you can use as well. But those tools, they are for freelancers, and you will have to work with them, and negotiate on the price and all the things that go along with hiring freelancers. But they can be very effective tools for finding a cover designer. Have you ever used any of those Jay? Jay: When I did my first travel guide, I designed it myself, and thought it looked fab, it didn’t. And so when I wrote my second travel guide, I went to 99designs and I really love that process because you fill in a little template of some concept ideas and any critical elements that you want on your e-book cover and then you get pitched. I got about 80 freelancers that pitched me ideas. At that point, you haven’t committed to anything. Then you do a shortlist that you want to work with and you maybe choose three or four.and you provide them feedback of say, “hey, could you make one tweak or one edit”. And they’ll do a second round. And once they’ve done that second round, you choose the designer that you want to work with. Then you go forward with them and , it worked out really well and he was great to work with. Lots of authors, when they’re designing their own covers, think they’re doing a great job, but as soon as you have a cover designed by a professional, oh my god, it’s amazing [laugh]. Michael: Yeah, you just want to crawl into a corner and cry because they’re that much better. Jay: That was my first book, I mean it sold but it was the only book in it’s niche and people had to buy it if they wanted to know about this area because there was no other travel guide. So, I think I lucked out on that but then when I started to build a line look and a whole theme around this series, I realized how bad they were. I am so glad that I invested in it. When you’re a beginning author, one of the key things that you have to remember is, you’re in this for the long hall so a cover design may be costing you a few hundred pounds or three or four hundred dollars but it’s a long-term investment for the life of your book. Don’t think of it as something that, “oh this is a big amount of money to spend”. If you have a great cover, it’s going to look great on Amazon, on any of the other distribution sites. It’s going to look fabulous on Twitter, on Facebook. That’s your shop window for your book, is your cover, so, it has to look good. And there are so many indie authors out there right now, and there are so many covers, there’s so much online activity around books that your cover has to stand out as a quality book cover. Michael: Oh absolutely, I mean, a good cover, that’s the price of the ticket. If you haven’t got that, you can’t even get into the stadium. You can’t play the game if you don’t have a good cover by a good designer. And there are authors out there that can design good covers, they are few and far between but there are some out there that can do it. But yeah, a good cover is absolutely essential and like you said, it’s an investment, you’re in it for the long haul and while it may hurt a little bit today, you’ll be so glad that you did it, three or four years from now. Jay: Yes. One of the other options, we had the Indie Author Fringe event on June 3rd and that was all around selling your book and one of the session sponsors was the Book Design Templates and I know they’re not the only company out there but it’s websites that have book templates with the image and your license to use the image and everything and you just drop your text in. It has the font already formatted and you just type in your text and then hey ho, you’ve got a cover. That’s a cheaper option than working with a bespoke cover designer that’s going to start your book from scratch. That’s a really good option as well, if you don’t have a lot of money and also, especially on Book Design Templates, it’s probably the same on all the other sites, you can filter by niche, so it shows you templates that have been specifically designed for your niche. Michael: Exactly, in fact, Magic Souls, the book that I was talking about, my first book that I re-branded. The first book actually had a pre-made cover and I had gotten that cover and it was nice, it looked great but it didn’t dial into the genre but there were so many other probably more genre appropriate covers at that time that I could have picked because the designers do a really good job of designing. Ok, I’m going to design this urban fantasy pre-made cover, I’m going to design this other genre pre-made cover and you can definitely use that filter and make sure that you grab pre-mades that are in your genre and that will make the heavy lifting a lot easier for you. Jay: When it comes to working with a designer, I remember in our last session, we gave some tips around how to work with your editor. What are some of the key things that have been important when you worked with a designer in the past? Michael: Yes, well I have, at this time, about 34 books, if I can give any advice to anybody that wants to know what the number one tip would be, it would be hire the right person. If you don’t hire the right designer, you’re going to have to do it all over again. The right designer is so important and when I talk about isolating those different elements, the different elements of covers, when you’re looking at designers, grade them based on those four different elements. How did their foregrounds look, how does their typography typically look, is it genre appropriate? If you pick the right designer with the right experience and the right enthusiasm for your project, that will just make the process so much smoother. That’s my number one piece of advice. Jay: And if you go and visit our blog, there’s a blog post on how to build a great relationship between yourself and your cover designer. We’ll post that on the show notes so that you can look at some of the key elements that you need to do when you want to build that long-term working relationship. Have you used the same cover designer on groups of your books or do you kind of hop around different designers? Michael: It depends on the genre. For my space opera, I use one designer for the whole series. She also did some work for me on my dark fantasy. But I’ve probably used six or seven designers and they’ve all had different skill levels. Some of them were fantastic. Some of them were less than fantastic. Others, I had some contract disputes and things like that with, so, you just have to find the right person. That really means looking at their work and just making sure that you would feel comfortable in handing this over to whoever you ultimately pick. And I also think finding the right balance for what you can afford versus the cover designers talent levels too. It’s also trusting the designer’s judgment. When you get that design and it’s maybe not the design that you thought it would be, to trust their judgment, to still give feedback and guidance but just know that you picked that person for a reason. Especially if they have experience in the genre and you want to trust that. If you find that you can’t relinquish that control, then I would challenge that maybe you hired the wrong person. You have to be able to trust what they give you and that all stems from hiring the right people. Jay: Yes, and that’s a key part of being an indie author isn’t it, surrounding yourself with a team of people, whether it is an editor, or proofreader or cover designer or whether you’ve got someone doing the internal formatting, if you’re going to exert that much control over the process, you’re never going to get a good team working together. Michael: Exactly and it comes into leadership, right? Being a leader, you’re the captain of your ship and you can’t operate every component and different area of the ship, you have to set the guidance and strategy and vision and the rest of your team helps get you there. Those are the basics of cover design and finding and working with the designer. We’ll be talking about designing your own cover in a future episode. We’ll cut it off there but this is a really big topic that we will probably spend many hours talking about, wouldn’t you agree Jay? Michael: Personally I love this topic and I really could talk about it all night, but we’ll go ahead and wrap it up for this month. So our question for the month; we want to hear from you guys, we’ve talked about this probably for a good 35-45 minutes and we want to hear from you: How did you find your cover designer? You can drop us a comment on the show summary page at www.selfpublishingadvice.org and if enough people comment you will also be able to see how others do it and how others have found their cover designers, which we feel is always a helpful learning opportunity for you. Our topic for next month is going to be getting ready for NaNoWriMo. It’s hard to believe it’s almost November already but we’re going to devote the October issue to getting ready for it, giving you some tips and strategies and for those of you who have never heard of NaNoWriMo, this will be a great opportunity to learn more about it and how it can really supercharge your writing career. We’re going to help you get ready for it and also tell you how to keep your writing going during the holidays because, for those of us who are listening, the holidays are coming fast and before you know it, we’re going to be in November and December. We’re going to give you some tips on how to keep the writing going and how to keep the spirit alive. As always, if you’ve enjoyed this episode, we encourage you to leave a review on your podcast network of choice as that helps us find more great listeners like you and it also helps the other shows on our network. Thanks for listening and we’ll see you next month. Happy writing Jay. Jay: Happy writing to you too, ok, bye, speak you next month. Book Cover Design Options for Every Budget: Alliance of Independent Authors member Paul Teague has created a series of Self-Publishing 101 videos to help Indie Authors achieve their writing and self-publishing goals. Readers judge books by their covers and the best option for indie authors is to work with a cover designer to make sure that your book appeals to readers in your niche and stands out from the crowd.